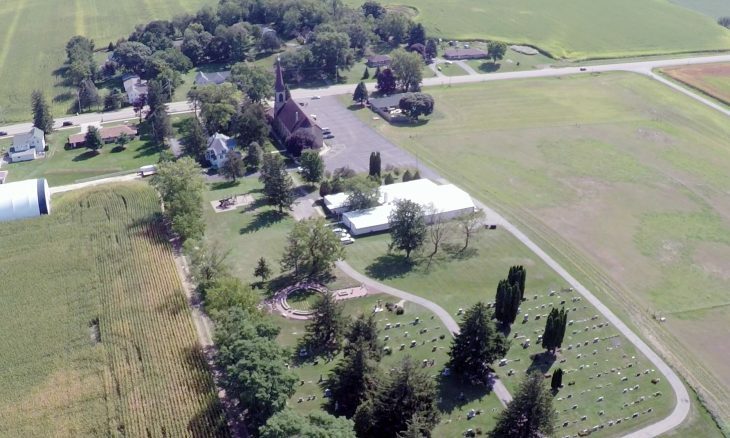 St. Mary of Pine Bluff is a glorious church surrounded by beautiful, idyllic rolling hills on the western edge of Madison, Wisconsin — helping many discover a profound sense of the Sacred. Founded by Irish and German immigrants in 1854, the current heavenly Gothic style church was built in 1888. 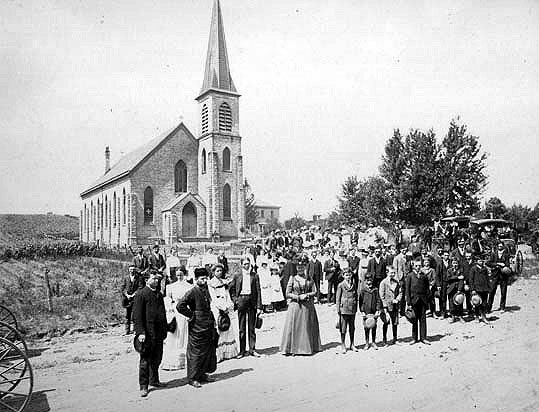 St. Mary of Pine Bluff, shortly after the present church was built. Photo circa 1890. Many are discovering the “sacred beauty” of St. Mary of Pine Bluff. The old adage, “Beauty is in the eye of the beholder,” is not necessarily true. There is such a thing as “objective beauty.” After over a half century of bland modern art and architecture, many today – especially young people – are longing for the sacred beauty that reflects the truth, goodness and beauty of God. They are yearning for a “taste of heaven” when they come to worship. They are finding this “transcendent beauty” at St. Mary of Pine Bluff. The solemn liturgies, devotions, treasures of sacred art and a rich program of sacred music has helped many discover a profound sense of the sacred, permeating their lives with a renewed faith. God became man and dwelt among us. He loves us so much that He wished to remain among us even after He ascended into Heaven. His real presence in the Most Blessed Sacrament of the Eucharist means that a church where He dwells becomes His house, a true foretaste of Heaven. Throughout history, the faithful have honored the splendor of God’s majesty in their midst by building beautiful churches where man, with his senses, could experience the Divine through the beauty of sacred art. The tall spires, the colorful frescos, the gilded altars, the aroma of burned incense, the realistic statues and paintings of saints and angels, the resplendent and vivid stained-glass windows… all of these capture the senses, elevate the soul to God and fill the faithful with awe as they enter an extraordinary place, a place that speaks more of Heaven than of earth. St. Mary of Pine Bluff Parish offers the Holy Sacrifice of the Mass according to the Roman Rite in both the Ordinary and Extraordinary Forms. The Ordinary Form of the Mass is offered both in Latin and in English according to the Missale Romanum, issued by Pope John Paul II in 2003. 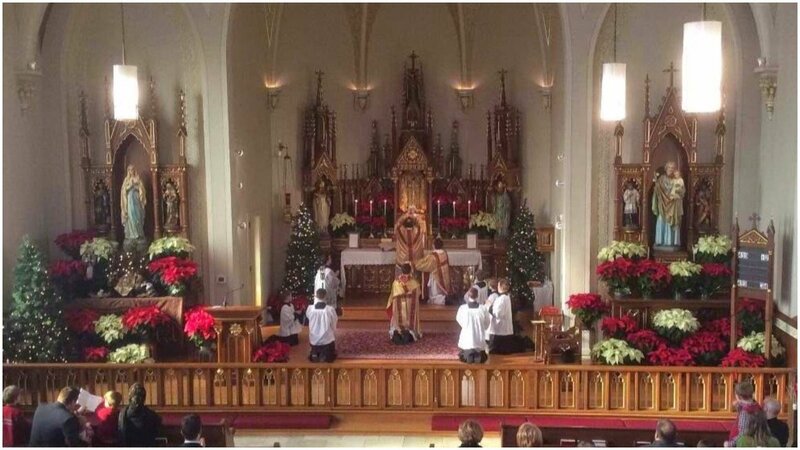 St. Mary of Pine Bluff Parish is also privileged to offer the Holy Sacrifice of the Mass in the Extraordinary Form of the Roman Rite, commonly referred to as the Tridentine Latin Mass, according to the Missale Romanum of 1962. The parishioners of St. Mary of Pine Bluff Church become actively involved in parish organizations according to their talents and interests. While some will become involved in apostolates of prayer and reach-out to the needy, others will be attracted to the choirs or to our evangelization programs. The organizations of St. Mary of Pine Bluff Church offer men and women, boys and girls many opportunities to actively live their Catholic faith. Stay up to date with news and happenings at St. Mary of Pine Bluff Catholic Church!